Your Effort Matters. Lets Bust This Test. Patient Test Taking - It is important to read the entire question all the way through. Not just once, but TWICE. Questions can be tricky and before you give your answer make sure that you completely understand the question. "Piece of Cake" - Jim's signature test taking tip. State Testing becomes a "piece of cake"when we break it down piece by piece. Breaking down test taking down step by stepis easier then taking the entire test all at once. Learning is a process and when we break it down step by step, it becomes easier and more fun. Test Taking Tips - Through the entire assembly Jim will give your students helpful tipsto prepare them for testing day. Simple tips such as: going to bed early, eating a healthy breakfast, doing something active, and more. These tips and others are given to students as a checklist to motivate students to take them into action. Your Effort Matters - We can't be our bestwithout you! Busting this Testis a team effort and we need everybody's effort. Jim will demonstrate the importance of teamworkduring State Testing period. School is FUN! - School is a fun safe place for you to be the best version of yourself. Be creative and allow others to be the best version of themselves. ""You are the kid's favorite guest. You have just the right mixture of message and entertainment and your involvement of the audience is wonderful." 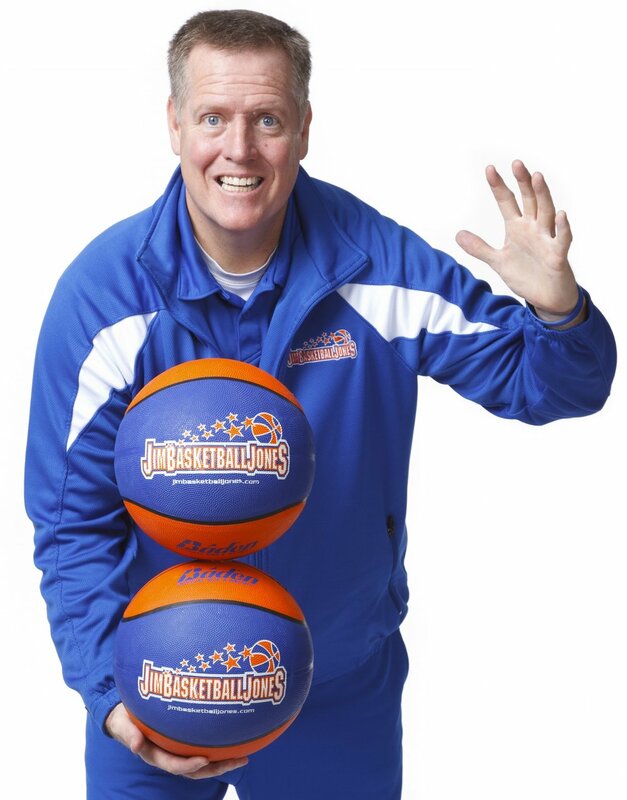 State Testing Preparation: Bring Jim "Basketball" Jones into your school just before the State Test to pump up your students and faculty. This assembly can be performed days or even weeks before your school's state testing period begins. Jim's test taking hints can be helpful all year round. State Testing Celebration: After your school "Busts The Test" its time to celebrate. Your faculty and staff deserves it after a entire testing period of giving your best effort and a Basketball Jones assembly is a perfect way to celebrate and have some fun. "I have taught for 21 years and have seen dozens of motivational speakers. You were by far the best!!! Jim will customize your school assembly to meet the needs of your school. This is a investment for your students and staff so make it the way you want it. If you like messages for Character Education, but also want to touch on Anti-Bully Education; we are happy to accommodate both. If you are celebrating Reading month, but would like Jim to share his message on "Applying Kindness", we have you covered. Being able to adjust and customize his message is what makes a Jim "Basketball" Jones school assembly a truly unique experience. Schools love how engaging and fun all Jim’s presentations are for both the students and staff. Everyone leaves happy and refreshed. Schools love that Jim is up to date on all the new research and movements within education (ie: GRIT, Growth Mindset, Mindfulness, Unselfie, PBIS, Leader in Me, Above the Line, PAX, etc.). His program is constantly growing and evolving, so schools can book him every year and grow right along with him. Schools love Jim’s audience management and how involved he gets the students. He truly has the audience right with him the entire presentation. Schools love his personal story of being in the Special Education classroom to eventually graduating at the top of his class in college. Book Your Amazing Assembly Today! !